The North London Waste Authority (NLWA) has taken part in the pilot edition of a Europe-wide campaign that aims to promote waste minimisation. Letsrecycle.com reports that the authority was the sole UK participant in the 'pilot edition' of the European Waste Reduction Week, which was held from November 20-30, and also involved councils from Belgium, Portugal, Spain, Ireland, Italy and France. Ruth Westcott from Waste Watch with resident Anna-Marie O'Donnell making a pledge as part of the NLWA's food waste minimisation initiative As part of the week, the NLWA ran a series of 'Love Food Hate Waste' roadshows across its seven member boroughs in an attempt to get local residents to sign up to pledge to reduce their food waste. 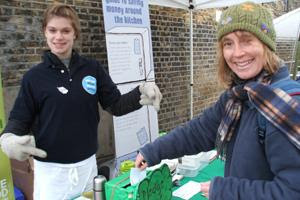 The authority said that "hundreds" of residents took part in the pledge, while visitors to the roadshows were also offered advice on cutting food waste and given reusable bags. The chair of the NLWA, councillor Clyde Loakes, said: "These roadshows were a brilliant way of giving residents the information they need to reduce the amount of food they throw away and we were delighted to see so many people taking pledges to reduce their food waste." 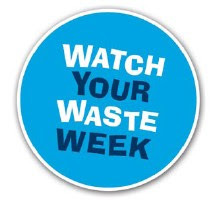 The authority has also revealed that an earlier waste minimisation initiative, 'Watch Your Waste Week', which was held between October 4 and 12, saw over 1,000 residents, schools and businesses reduce their waste by up to 50%. As part of its waste reduction efforts, the week also saw 1,908 people signing up to the mailing preference service and 6,806 more becoming members of online used item trading network Freecycle. PilotNorth London took part in the pilot of the European Waste Reduction Week as a member of the international Association for Cities and Regions for Recycling and Sustainable Waste Management (ACR+). The body has nearly 100 members, including local authorities and umbrella organisations representing councils, and the week is part of the ACR+ 'European Campaign for Waste Reduction', which was launched last year with the aim of reducing municipal waste by 100 kilograms per person, per year. The initiative also mirrors the emphasis on waste minimisation and prevention within waste hierarchy which is part of the recently published revised EU Waste Framework Directive (see letsrecycle.com story). And, two of the three waste performance indicators that English councils can choose from reward success in waste reduction.